Want to find the lateral and surface areas of a cone? Don't have the slant height? No problem! This tutorial will show you how to use the Pythagorean theorem to find the slant height. Then, you'll see how to find the lateral area and surface area. Take a look! Want to know how the find the lateral and surface areas of a regular pyramid? Then this tutorial was made for you! 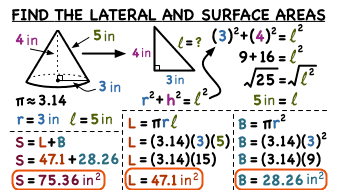 You'll see how to apply each formula to the given information to find the lateral area and surface area. Check it out!